We carry a wide variety of products for all types of industrial use including items that are UN approved for hazardous products. Consolidated Bottle has been servicing the Industrial market for close to a century. 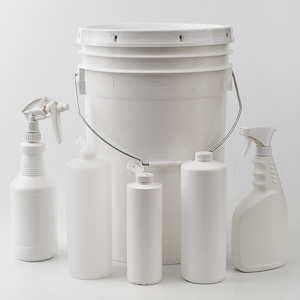 Our stocking program offers an expansive scope of products well suited for this industry including bottles, jugs, pails, drums, and an assortment of closures. Please see our catalogue. We have a large library of custom molds that are available for immediate production. Our design teams can offer innovative ideas and extensive experience in development of new product lines. We can also silkscreen, label, or shrink sleeve your package all under the same roof.